←Smooshy Thursdays: Lawyers can be Multipotentialites Too! I’m sitting on a futon in an apartment that’s brimming with potential, but presently bare. My brain is fried from the heat of the night. My body aches from carrying that microwave home yesterday. Over the last three weeks, my work has suffered, my social life has suffered, my sleeping hours have diminished. But lying beside me, snoring softly, is a little bearded schnauzer. So sweet, and sounds much like being a new parent;) Everything is okay even when it’s doesn’t feel like it. Yeah, it is remarkably similar to parenthood I think. Constantly removing things from her mouth, watching her at every second, worrying and feeling guilty when I leave the house. But yes, lots and lots of love and snuggles which makes it all worthwhile. I love that feeling being around my furbabies! Its wonderful! Heh yup! What kind of furbabies do you have, Kim? and I gotta say, Grendel is just the CUTEST! 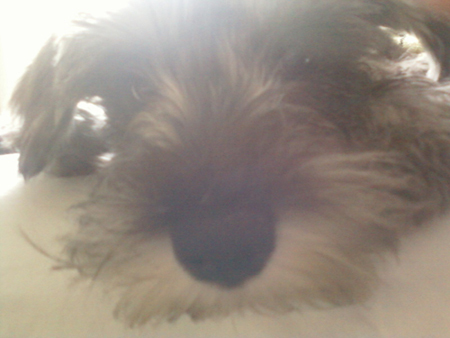 I had a schnauzer mix when I was a kid. Love them. And thanks! Schnauzers are awesome. I had one growing up too. Like, like, like! Animals have a way of making things ok, like you say, just by being there, trusting us and carrying on. Don’t know where I’d be without mine but I know life wouldn’t be the same. Good luck bringing out the potential of your apartment – clean slate, how fun! Thanks for the comment, Alison. Such a sweet face! What would we do without furballs?! A elderly relative asked me recently if I was planning to ever get married + I replied “maybe when interspecial marriage is legal? ” LOL. No one could ever love me as much as my Oscar! Grendel is Gorgeous:) Best Wishes for your New Home! Best wishes for your new home, Emilie! I am in a similar position regarding the empty apartment with lots of potential, having relocated from Portland. I miss the cool weather, lush greenery, clouds and rain:) although I must say, my new location in the Bay area has lots of trees, too. No pets yet though. OMG! I have a Schnauzer myself ( Darwin Einstein Macey) and he just melts my heart. Gives me so many kisses and calms me down when he stares at me with his beautiful brown eyes.